Pours a pale copper almost straw color. Good carbonation but not much of a white head was produced. Some spice and some light malts on the nose but there is also an odd almost sour aroma. It’s kind of sweet and almost yeasty. There are Odd and very light flavors in this one. The high carbonation makes this somewhat refreshing. There is not much going on in the taste of this beer. You start with just a tiny sweetness that is washed away quickly by the effervescence over your tongue and then there is the only real flavor in the beer on the back end of the sip and its not very good. Some spice but more of a citrus and sour taste on the back end. The final aftertaste is pretty much non existent like an American macro lager would be. This is so carbonated that there is a little bloating feeling. I’ll let it set for a while and see what happens when it warms up a little. Well as it warms up a little it is a little smoother but it’s not really any better. There is still an odd almost sour taste on the finish. It’s not offensive but it doesn’t seem right either. OK this is the best I can do, it’s an artificially spicy sour blah beer. Like I said it’s not offensive but it doesn’t taste good either. 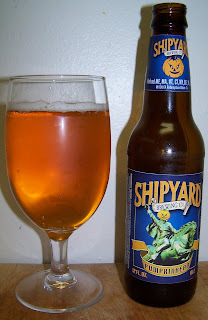 Mediocre at best for the Shipyard Pumpkinhead Ale. I’m not sure what that would be in a letter, a D maybe. I honestly thought this was the worst of the bunch (even over the Jacks which I had just before it!). Granted I have a few more to go, I just don't see them getting worse than this one. At least Jack's didn't smell funny. Not saying Jack's was a good beer, just that my taste found this one to be worse.